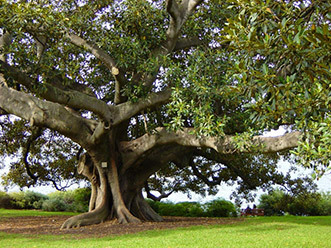 Moreton Bay Fig, Ficus macrophylla, is an evergreen tree that can grow up to 200′ tall with a massive trunk. Long sprawling branches and large leaves make this a gorgeous shade provider. 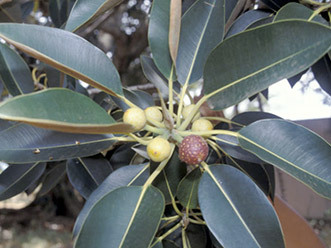 Glossy oval-shaped leaves grow 6-12″ long, and bleed milky sap if cut or broken. Its figs grow to about 3/4″ – 1″ in diameter, and are green when unripe. When ripe, they turn from red to purple with lighter spots, and ooze clear sugary sap. 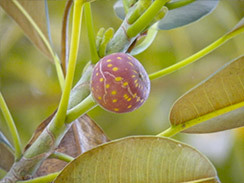 The fruit is mildly sweet, less fleshy than commercial figs, and filled with tiny seeds. Some people describe Moreton Bay Figs as unpalatable, but I disagree. Native to Australian rain forests, the species was imported by boatload to Southern California in the 1875 and given to anyone who showed up at the dock. They were planted across Los Angeles’ chaparral, where some thrived. I’ve seen these trees growing in widely differing Los Angeles environs, from Santa Monica’s ocean-air sidewalks to hot dry dirt patches on the edge of the San Fernando Valley. If picked when their sap is oozing, they’re a nice treat popped from the tree right into your mouth. Some folks make jam with the fruit.